We’re in the middle of a big transition right now. And right now, I hate my stuff. All of it. Well, almost. Okay, not really. It’s when things multiply in closets over the years that you start to eye those trendy Tiny Homes with new interest. Do you think the ladies of World War II and the WASP had that issue? Just what did they have to keep up with during their moves? Let’s take a peek at their living quarters, called bays. 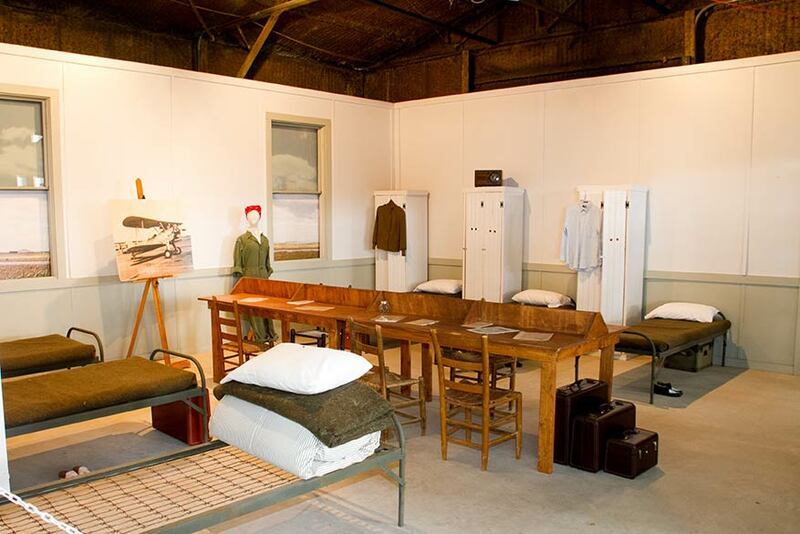 By the way, six cadets shared a bay, and two bays–twelve cadets–shared one toilet and one shower. See those white lockers? Each cadet filled half of one. So, imagine your junior high school locker. Now imagine living out of it. Cadets could also have a smallish suitcase or footlocker, but that was it. Not much to go on, but not much to have to keep up with, either, when living on the go. It makes me appreciate anew the situations that they and all service people live in. Agreed! It makes my sharing the bathroom with one sister look like small potatoes. That was never really bad, anyway.